In the first week of January, Senator Kahuda Babar of Balochistan Awami Party (BAP) tweeted that Balochistan’s chief minister should vacate the office of president of BAP. He argued that the changing the president of BAP was greatly needed. His tweet once again started the rumour that government led by Chief Minister Jam Kamal is facing an internal coup from its own party members. Last week, another picture taken at Quetta Airport further fuelled speculations. In this picture, Balochistan National Party-Mengal (BNP-Mengal) President Sardar Akhtar Mengal was seen standing with BAP leaders, one of them being Balochistan Assembly Speaker Quddus Bizenjo, who is allegedly spearheading efforts to topple Jam’s government. BNP-Mengal is in opposition in the Balochistan Assembly and this picture hinted that this party is on the same page with BAP dissidents in their desire to topple Jam’s government. However, the victory of BAP’s candidate in the by-election for a vacant Senate seat suppressed the rumours for now. All BAP members voted for Manzoor Kakar in the Senate by-elections. This allowed CM Kamal to claim that there are no rifts in BAP and he dismissed claims that there were differences within the party. This may be a small sigh of relief for Jam Kamal but political uncertainty looms in Balochistan. Since assuming the office of chief minister in August last year, Kamal’s government’s future has been uncertain. This is because of two main reasons: the dissidents within BAP and the presence of a powerful opposition. BAP came into existence just a few of months before the July 2018 elections. Most of BAP leaders are those so-called ‘electables’ who always win their seats because of their tribal influence. Previously, these people were scattered in various parties but now they all gathered under the umbrella of BAP. As a result, BAP turned out to be the single largest party in Balochistan Assembly and easily formed government. The problems for the government started after the allocation of ministries by Jam Kamal. The ruling coalition has a strength of 41 MPAs and it is not possible to provide ministries to all of them. The 18th Amendment has capped the number of ministries in Balochistan to 15. Those BAP members who could not get a ministry of their choice, or not any ministry for that matter, picked up daggers against Jam’s government. Dissidents within BAP are those who joined the party in the hope of getting lucrative ministries and they were disappointed after allocations were announced. CM Kamal even kept the important portfolio of Planning and Development (P&D) with himself. Moreover, for the first time in more than 20 years, Balochistan Assembly has a sizable opposition. The total strength of opposition in Balochistan Assembly is 24 and they are just nine short of forming their own government. BNP-Mengal and JUI-F, the two largest opposition parties are facing pressure from their ranks to join the government. BNP-Mengal was last in government in 1998. Two decades is a very long time to be in opposition and therefore the demands to form government are understandable. Likewise, the JUI-F has been in opposition since 2013. Six years is not a long time in opposition but given the nature of the party, it can’t remain out of power for too long. The strength of opposition along with their desire to form government amplifies the threat for Jam’s government. BNP-Mengal and JUI-F can easily form a government with the support of disgruntled elements in BAP. Smaller parties such as Hazara Democratic Party (HDP), BNP-Awami and Awami National Party (ANP) can also join the opposition if they saw that Jam’s government is doomed. Additionally, the conditional support provided by BNP-Mengal to the PTI in the centre is also not making any headway. Consequently, BNP-Mengal can start hostilities with the PTI by toppling its coalition government with BAP in Balochistan. The looming uncertainty has affected the functioning of government machinery in Balochistan. The bureaucracy is reluctant to make decisions, given that there seems no guarantee that the government will survive in the next few months to come. Most of the major decisions are being stalled till the time when political certainty returns to Balochistan. An official of Balochistan government confided to this scribe on condition of anonymity that the political uncertainty was preventing the government machinery from working effectively. Another result of this political crisis is that it has stalled the progress of development initiatives. Balochistan needs development works and at the same time, it is cash-starved due to bad governance of previous governments. In such a scenario, the government needs to take bold steps to pace up the release of funds for development projects in time. With all that is threatening the stability of this government, development initiatives have become an afterthought. Moreover, owing to its political weaknesses at home, the Balochistan government is not in a strong position to argue its case before the federal government. It is an established fact that Balochistan was left out in China-Pakistan Economic Corridor (CPEC) projects allocation. Balochistan also failed to get any major projects in the 8th JCC in December 2018. Balochistan has to stand up to the federal government for an increased share in the CPEC projects. However, this would not be easy to do when the Balochistan government is at the mercy of support provided by the PTI’s provincial chapter. Likewise, the federal government recently constituted the 9th National Finance Commission (NFC) to revise resource sharing formula between the centre and provinces. 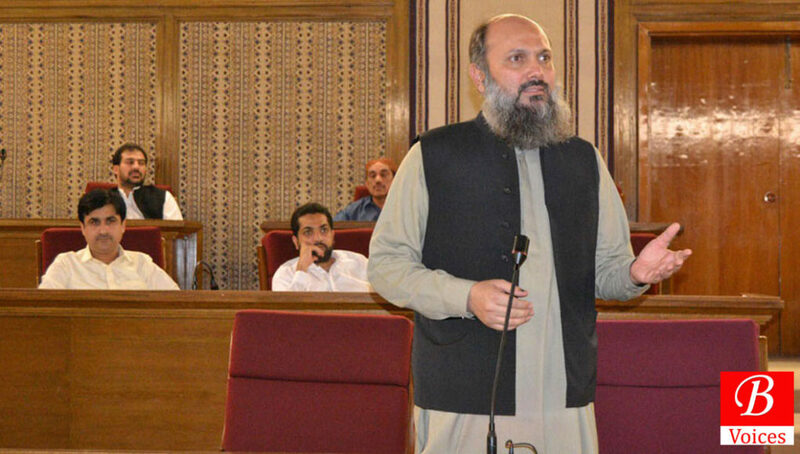 Although Balochistan has a competent non-statutory member in NFC in the form of Mahfooz Ali Khan, the provincial government lacks the required strength to take a stand on major points during 9th NFC deliberations. The political crisis at home will severely affect the bargaining power of the Balochistan government during 9th NFC award. Simply put, the government is not in a position to protect the interests of the province which are at stake in the NFC. Furthermore, if BAP dissidents form a government with the help of BNP-Mengal and JUI-F, then this government will also be weak. This situation will result in another strong opposition in the form of BAP and PTI. Therefore, it is likely that they will also be unable to take any major decisions. In this backdrop, it is in the best interests of the province that opposition and BAP dissidents allow Jam Kamal’s government to function. His government should reciprocate by taking the opposition on board in taking major decisions and deciding about development funds. This arrangement serves the interests of the province in the best possible way. However, given the complicated nature of politics and the dynamics of Balochistan and the vested interests involved, the aforementioned suggestion is only wishful thinking.